Optical fiber can be used as a light conductor and can produce end-of-fiber light in the form of a beam of greater or lesser size, which is what we call the end light fiber optic. This is the most common use of optical fiber. Optical fiber can also be packaged to produce lighting along its length, such as a soft neon that highlights lines, this is what we call the side light guide. The OPTICPOOL pool enhancement technique developed by Luxeri. The OPTICPOOL attachment channel for diffusing fiber Ø = 8mm has been specially developed for pool applications and can be installed in an existing liner pool. Its crystal PVC transparent material makes it possible to obtain a perfectly circular effect of a fiber and thus to create a unique luminous effect. The light thus diffused can be reflected on the edge of the coping. It has an anti-UV treatment, algicide in order to obtain a good aging. Packaging in roll of 15m. The installation is simple. It is done under the coping in the profile of fixing the liner by pressure or by gluing. 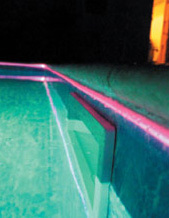 Other types of installations may be considered for other types of swimming pools. The manufacture of this PVC material gives the OPTICPOOL system as a special feature a flexible effect that allows, if necessary, to position the channel in one direction or another.